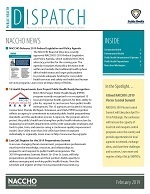 NACCHO's monthly newsletter contains news, resources, and information about Community Health, Environmental Health, Public Health Infrastructure and Systems, and Public Health Preparedness. Dispatch also contains information about funding and grants, award opportunities, and upcoming events. The "Notes from Washington" column rounds out each issue to keep you informed about legislation that might impact public health.